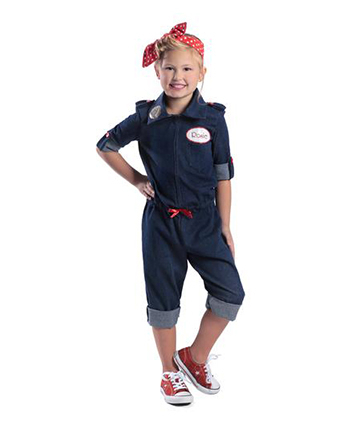 The Rosie the Riveter Costume includes a zip front Jumpsuit with elastic waist and a head wrap. Rolled sleeves and pants are sewn at the cuffs and do not unroll. Your child is sure to stand out this Halloween as everybody's favorite Rosie the Riveter. Comes in youth sizes Small-XL.